Northeast members of Surface Design Association met at the Fuller Craft Museum on October 27, 2018 for a day of networking, sharing work and inspirational books, the opening of Context: Language, Media, and Meaning—a juried exhibition of work by SDA members from Connecticut, Massachusetts and Rhode Island—and Words Matter, a presentation by Stuart Kestenbaum. Adrienne Sloane and Nancy Crasco (Massachusetts/Rhode Island Co-Area Reps). Background: Nancy Crasco Parched Fields, from Context: Language, Media, and Meaning. With a thoughtful, often humorous, mix of words and poems, Kestenbaum mused on the creative process and connections found in writing and making. Audience members found useful insights and commonalities about intent without being caught up in the distractions of technique. Thinking about our difficult times, Kestenbaum commented, “this is a really good time for poetry. The darker it gets, the more people want poetry.” Also, “Makers distill things…Makers are engaged in ‘mend and repair.’ Mending and repairing are about hope.” Currently the Poet Laureate of Maine, Kestenbaum is the former long-term director of the Haystack Mountain School of Crafts. 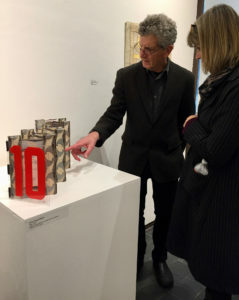 Guest speaker Stuart Kestenbaum investigates Anita Gangi Balkun’s Ten, from Context: Language, Media, and Meaning. 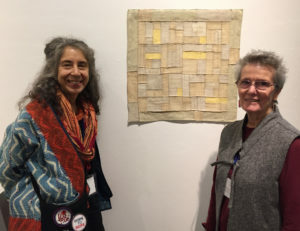 During the morning mix of activities in which participants shared work in small group sessions, we learned the gathering included fiber artists working in a wide range of media, with varying levels and duration of engagement. Many had longtime involvement in studio work; some exhibited often, some not at all. 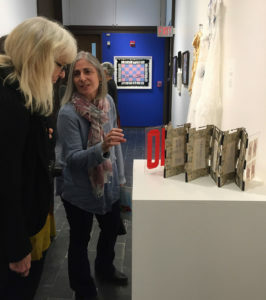 At the same time, the group included educators in K-12, workshops and college-level classes, exhibition curators, writers, and community nonprofit leaders. Attendees shared favorite books, and some groups discussed questions relevant to studio practice and career development. Members came from all over the Northeast, plus Virginia. A Nor’easter had created a surprisingly blustery, rainy day, preventing Maine members from attending. Aside from not being able to spend time outside on the beautiful grounds of the Fuller, no one seemed to mind. Ania Gilmore describing her handmade paper works during Spend A Day with SDA at the Fuller Craft Museum. Sharing personal studio work during Spend A Day with SDA at the Fuller Craft Museum. 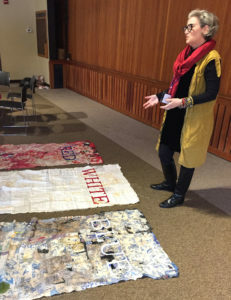 A brown bag lunch included a look at the SDA Swatch Collection, participatory community art projects like Andrea Vail’s (North Carolina) Friendge and Adrienne Sloane’s (Massachsetts) Cast (on) Your Vote, as well as the distribution of member-donated door prizes. Michael McMillan, the Fuller’s assistant curator, spoke about additional exhibitions currently on view. Uneasy Beauty: Discomfort in Contemporary Adornment also featured works by SDA members April Dauscha (South Carolina) and Erica Spitzer Rasmussen (Minnesota). 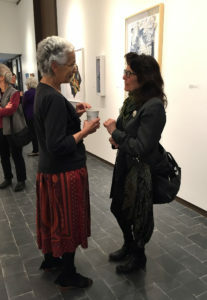 Kestenbaum’s presentation was next, followed by the opening reception for the SDA exhibition, Context: Language, Media, and Meaning. Juried by Bruce Hoffman, the textile-inspired artworks on display incorporated written language. 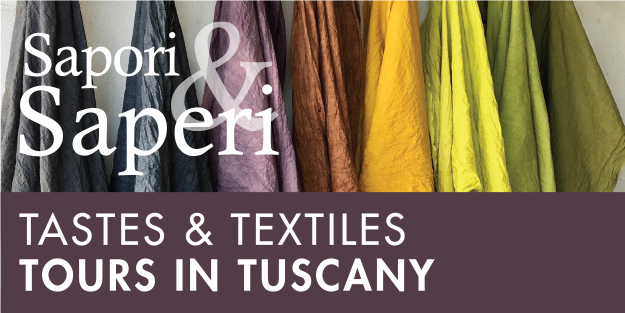 The exhibit closes on February 24, 2019. Anita Gangi Balkun shows her collaborative piece Ten, at Context: Language, Media, and Meaning. 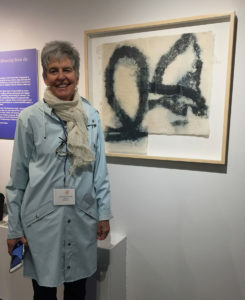 Jennifer Davies with her prize winning Street Glyph 2, a monotype on handmade paper, from Context: Language, Media, and Meaning. Opening reception Context: Language, Media, and Meaning. As the day progressed, the enthusiasm generated by shared connections and experience was palpable. Many spoke about making this type of gathering a more regular, perhaps longer, event. Others spoke about the high quality of exhibits on display at the Fuller and the attraction of visiting it more frequently. Indeed, SDA is extremely grateful to the Fuller for sharing its facilities and hospitality with us. SDA Area Reps Ellen Schiffman, Adrienne Sloane, and Nancy Crasco helped organize the event, along with SDA President Astrid Bennett. Their experience will help fine tune the SDA Event Toolkit for use by other regions in planning their own future events. 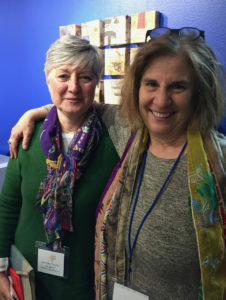 Jennifer Coyne Qudeen and Ellen Schiffman (Connecticut Area Rep). 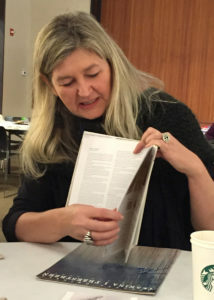 Background: Jennifer Coyne Qudeen Tea Stories, Collection 1, from Context: Language, Media, and Meaning. I love to attend museum events like this one. I enjoy looking at arts and crafts. They are very relaxing.